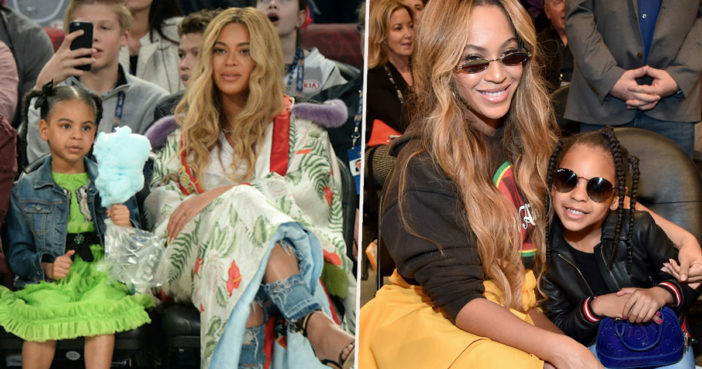 A true genius has made a side by side picture collage of Blue Ivy and a seven-year-old Beyoncé, and the mother-daughter resemblance is uncanny. From the same beautiful hairstyle to the same adorable little face, you could be forgiven for thinking you were looking at a pair of genuine twins. Some people have even had a hard time believing they are looking at two different people, claiming it was a ‘reflection’. Now, Beyoncé barely ever uses a caption on her Instagram, so this just goes to show how in shock she was after realising she had a mini me. And the Beyhive became alive with a single, united gasp as fans buzzed and pondered over the possibility of Beyoncé 2.0. Some even urged their Queen to ‘start a dynasty’, with Blue crowned as Bey’s stadium successor. Although she is only seven years old, Blue Ivy has already led a whirlwind celebrity lifestyle and has the sort of wardrobe many adult fashionistas would envy. It’s easy to imagine her one day leading a loyal legion of fans of her own. Of course, it is not yet known whether young Blue shares her mother’s passion for performance. What we do know is that Blue has quite the creative flair when it comes to photography. Another recent post from Beyoncé shows a series of bright and brilliant pictures. Some show the Lemonade singer in a striped jumpsuit, while another is a close shot of her bejewelled fingers. The cutest picture is undoubtedly the one of Blue Ivy, lying back on an intriguing spiky cushion while wearing a pretty flowery tracksuit. And who could this talented fashion photographer be? Well, Bey has credited the pictures to ‘B.IV’, i.e. Blue Ivy herself. Fans have of course been deeply impressed by the youngster’s photography skills, with one person solemnly describing her as being the ‘best photographer on earth’. Blue Ivy’s photography skills aside, fans have been shaken to the core by Beyoncé’s decision to caption, seeing this as the equivalent of getting a text message from the singer herself. Many have been greatly enthused by this unusually personal – and ordinary – touch from the Everything Is Love goddess. Beyoncé’s caption is so mortal-like. She even used this emoji 🥰. I think she posted it herself and not her assistant. Beyoncé made captions. She’s talking to us. Everybody is cancelled. We are broken up. Don’t text me. I’m not buying you anything for Valentine’s Day. Move, ugly! I must say, it’s genuinely sweet to see how – despite her superstar status – Bey still captions like everyone’s mum ever.